Fig. (5) PGN632 treatment reduced the virus load in guinea pigs infected with Pichinde virus. (a) Virus load in tissues on day 10: Guinea pigs were infected with 105 PFU of virus and were treated with PGN632 (6 mg/kg, i.p.) on day 4 and again on day 7. The guinea pigs were sacrificed on day 10. The histograms show virus load in PFU/g in the tissues. (b) Virus load in tissues on day 14: Guinea pigs were infected with 105 PFU of virus and were treated with PGN632 (6 mg/kg, i.p.) on days 4, 7, and 10. They were sacrificed on day 14. 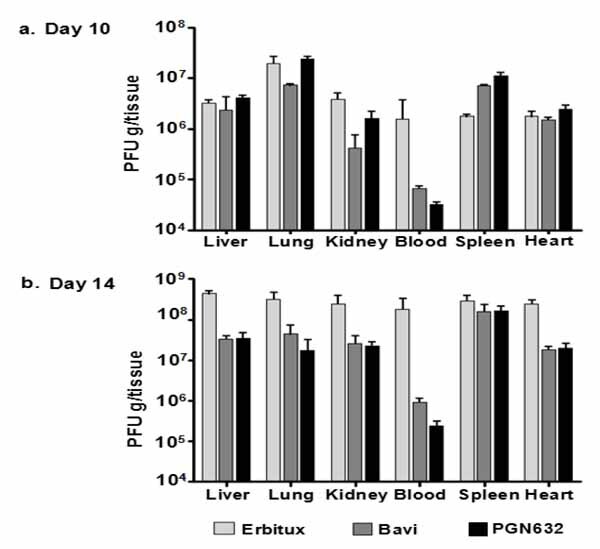 The histograms show PFU/g in the tissues. Bavituximab treatment was given as a positive control, and erbituximab as a negative control. Columns, mean PFU per gram of tissue (n=3); bars, S.D.